SOS Children's Villages has been working in the Philippines since 1967 and in Bataan since 2009. Children in the Philippines continue to face dreadful conditions and our organisation provides families and children in need with support so that they can stay together. SOS Children's Villages is located in the town of Mariveles, Bataan in the Central Luzon region north of Manila. Mariveles is one of the biggest cities in the region, and its population is increasing at a rate of over four per cent a year. Traditionally the town's inhabitants lived off agriculture and fishing, but more recently the town has become home to the Bataan Economic Zone which attracts many businesses and industries. As more land is used for the city's industrial and residential expansion, agricultural activities are threatened. In order to escape grinding poverty in rural areas, many move to Mariveles in search of a better live. However, most end up joining the thousands of urban poor. The city's economic development has not reached everyone – around a third of the population is unemployed and an estimated ten per cent of the population lives in poverty. Demographically speaking, the city is young - around 35 per cent of the population are children under the age of 14. Families living in these conditions struggle daily to put food on the table and look after their children. Children often suffer from malnutrition or ill health. The municipal authorities therefore instigated a local strategy to improve the lives of children. For example with regards to health, a tuberculosis screening programme was set up, and other activities were started in order to feed and care for malnourished children. Another great concern is the fact that many parents cannot afford the extra costs of sending their children to school; they can only do so with the help of scholarships. SOS Children's Villages has been present in the Philippines for over four decades. We have worked closely with other organisations responsible for protecting the rights of children. Since most SOS Children's Villages in the Philippines were in the south of the country, we decided to build the country's eighth SOS Children's Village in the Central Luzon region in order to step up the fight against the social problems of the north. 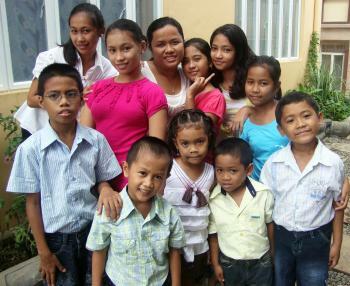 The SOS Children's Village is situated in the Golden Heights Subdivision of Mariveles. The SOS family homes are perfectly integrated into the surrounding residential area, and the children find it easy to integrate into the community. We offer family strengthening programmes, counselling and psychological support to families and children in the neighbourhood so that they can stay together. In conjunction with local agencies, we aim to provide children with access to essential services in order to promote their development and enhance their social skills. We offer families advice on parenting skills and on legal matters. Children are offered scholarships so that they can attend schools, and provided with after-school care and computer literacy lessons. 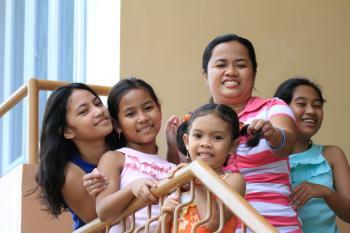 Children who have lost parental care can find a loving home in one of the twelve SOS families. They grow up with their sisters and brothers in a familial environment full of love, respect and security. The children from the SOS families attend the local schools, as well as lots of events organised by the local community, and the activities we hold are also open to neighbouring families. The children in our care are offered special support according to their needs, be it with their school work or with therapy.